This ribbed steel outdoor receptacle is perfect for public parks, shopping centers or schools. The flared top makes the opening hard to miss, and the receptacle comes standard with a removable rigid plastic liner. 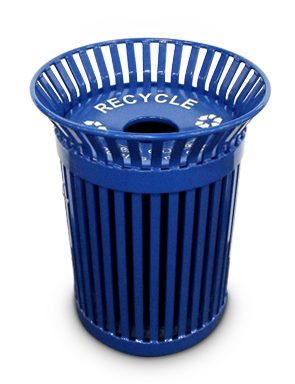 Choose to use this outdoor receptacle as a standard trash or recycling receptacle. Receptacle base is available with or without a door for easy liner removal, and the flat top lid with a round opening is available with or without recycling labels. Powder-Coated color options shown below. Holds 24 gallons.